Matilda is a very special dog who helps everyone in the neighborhood. Her nickname is “Gandhi” and I think of her as my unicorn. Terrified rescue dogs calm down when she touches them with her nose. She is also a certified therapy dog and has helped many humans. It’s possible she’s saved lives. Matilda came to Brooklyn, and to me, at age eight, in 2008. She had been rescued twice, once from the track, and then from a disrupted family. Her affectionate, peaceful nature allows her to make friends wherever she goes. Now she has fallen on hard times, health-wise. 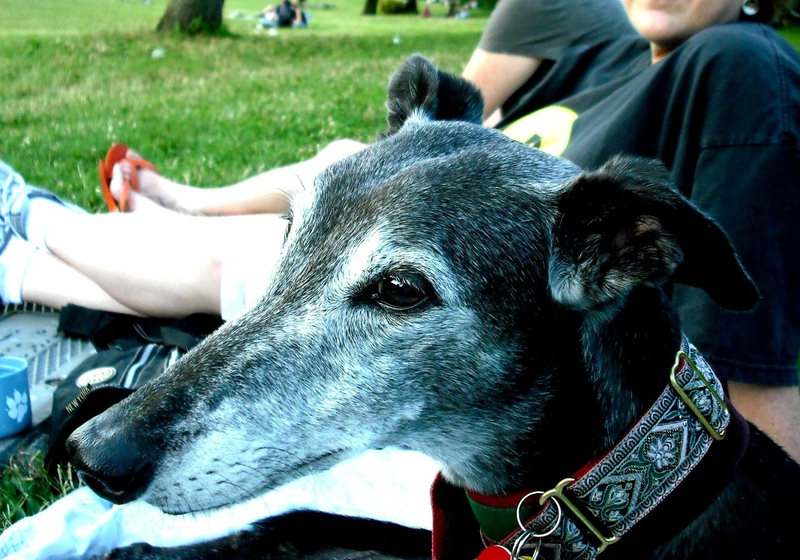 Greyhounds have a relatively long life expectancy – many live to 17 or 18. Last month, Matilda was diagnosed with Lymphoma. Her Oncologist has encouraged us to proceed with chemotherapy, and told us that her prognosis — and the prognosis generally for this sort of Lymphoma — is good. At first I thought, really? Chemo? Won’t that be miserable? Chemo is so hard for humans. But Dr. Britton explained that chemo for this cancer, and for dogs generally, is very different than it is for humans – that is, quality of life is the main goal. I took tremendous comfort in this. So, Matilda has begun treatment and already she is doing very well. This beautiful being, who has helped so many people, deserves a few more chances to sniff the flowers, romp around with her sister and brother, and offer her soft snout to neighborhood kids and adults alike for petting. Many people have offered their cancer struggles and triumphs when they learn of Tillie’s. Please let us hear yours, and share knowledge and support each other. Thanks for reading. June 18, 2013: Matilda has just completed the six month protocol of chemotherapy, and is in remission! She still needs all the good wishes and prayers, but she is well now, and she has gotten an extra six months! Remission is not cure, so each day is special and precious. Now her blog will be a celebration of her life, and the other things that it has become–a place for rescue dogs to ask for homes, and a place for Matilda’s siblings to express their feelings about compassion and dog life in general, a place for therapy animals to be have the lime-light, and who knows what else! Our Blueberry is a cancer survivor. Two years ago she had neurofibrosarcoma, a nasty bump on her head that literally popped up overnight. It all happened so fast that we didn’t have time to think about it too much. Her surgery happened within a week of finding it, and so far there has been no recurrence. Definitely contact Dr. Cuoto at OSU if you haven’t. The services and consultation are very helpful! We wish Tilly the very best in her battle! Thanks so much. We have an amazing oncologist at Blue Pearl in NYC. I’m so happy that Blueberry’s cancer was caught quickly and dispatched. Did she have to have any chemo? Beautiful dog Terry! I sure hope all goes well and she recovers fast. Over the last 20 years I have lost 2 retired rescued greyhounds to cancer. All of my greyhounds have worked as Therapy Dogs and it was such a wonderful experience for everyone involved. Losing such a dear friend of the community is so very difficult. I am so happy that Matilda is getting such great treatment! My best wishes for her recovery. The greyhound community is behind you and will do everything we can to help. You are soo soo kind. Are you going to the Blog Paws conference? Thanks for this beautiful note of support! Did I ever thank you for this? I hope I did!!! Thanks. Your little cuties are all very huggable I see! I’m so glad that Tillie has such thoughtful humans. She seems so sweet. Did I meet her at Blog Paws? I was at the chick booth. Matilda is beautiful. I love Greyhounds. They are such wonderful dogs. Matilda sounds like a very special Greyhound with healing abilities. I really hope and pray the chemo helps. She’s too young to leave the world yet. Thank you so much for your kind words. She is doing well, and we try to take things day by day. Our Kasey died of lymphoma at age 7. He was given 6 weeks to live upon diagnosis if no chemo. The chemotherapy extended his life another 7 months – enough for us to enjoy one more spring and summer with him. It’s true, dogs don’t suffer as people do because the chemo is less intense to preserve quality of life. I’m so sorry and wish you and Matilda all the best of luck in beating the cancer. Thank you so much for the good wishes.I wonder what will happen when the chemo is done. Of course you speculate. How much time will she have? One simply cannot know. So sorry about your Kasey. But it does feel that you get them for a little extra time. Thanks for joining our Blog Hop today – how is Tillie doing? We lost our Becca to osteosarcoma just a year ago. She did have chemo, but did not respond well to it. She was 12 at the time and it was just too much for her, so we stopped it immediately. That’s not to say your experience won’t be different than ours – I hope it is (or maybe was). Thanks for asking about Tillie. I’m so sorry about your pup. Actually osteo is a much more virulent form of cancer I’ve been told. Matilda has only one more chemo treatment, next Wednesday, and then the six month protocol is completed. (She is already in remission). She has done pretty well with the chemo, but again, it is not as severe as the osteo chemo drugs. So, we will see how she does after the chemo. She might have a few months, or maybe longer. At least we got to have her around for this six month period, and maybe a little longer. She is 13. Yes, I did meet your mom at BlogPaws. Matilda and her brother and sister were also upset that they didn’t get to come along. Thanks for your good wishes. Fortunately Lymphoma has a pretty good remission rate. Matilda is in remission, so she still has some time left with us. I’m so sorry your mom’s first pup died from pancreatic cancer. So sad. I’m glad you and your sister are there with your mom now and staying so fit. I enjoy your adventures a lot. Your running outfit is especially becoming. Nice to meet you. Tillie sounds like a very special dog and we send our love and best wishes for her senior years to be happy and full. Thank you Wyatt and Stanzie. I have a pretty good time in life. I haven’t been doing my Therapy Dog work since I got sick, but I learned a new trick. I could teach it to you, but don’t let your parents know it was me. Ok, what you do is, when you want an extra treat at night, you bark this high pitched bark that your parents haven’t heard before because you used to be really quiet. You keep it up until your parents cannot stand it, and they give in and give you a treat! My mom also doesn’t want me to lose weight because I go visit these nice people once a week who make me take terrible medicine, but then let me sleep on a nice bed and pet me and kiss me most of the day. Keep me posted on how the trick works for you. You are so kind. Thanks. She had a rough night last night. Thank you so much Speakdoggie. We appreciate that! I hope Tillie is doing well with chemo. Thank you so much. She had a set-back this weekend, and is slowly recovering. Thanks so much. She is doing very well. She is in remission now. What kind of chemo is she getting? My heart and soul – Angel – also has cancer – lymphoma, and she is getting UW – MADISON CHOP. She’s only had 5 treatments; she has reacted badly to Cytoxan and they won’t administer chemo under those circumstances, but already they say she’s in a very, very strong partial remission, or possibly a complete remission. I know I’m just buying her time, but it’s worth it to me. Hope Matilda does well also. Will be looking anxiously every day for reports. Hi Rada. Actually, Matilda just had her last chemo today. We just got home a little while ago. She has been getting L-CHOP (in NYC at a place called Blue Pearl Veterinary Partners), which is probably similar to what Angel is getting. Her first chemo treatment was December 13th, so it has been about six months. She had an infected cut on her paw last week, and was unable to get her last treatmentuntil today. I am still so exhausted from caring for her during the time of the infection, that I am just sighing slightly in relief now. Also, I know that she probably won’t feel all that well for a few days, because she got adriamiacin (sp? ), which is the strongest it seems. My heart goes out to you. I’m so glad that Angel is in remission. Will they try the chemo again? I will e-mail you. We can be support for each other. Thanks Cramercare. I know pretty much how you feel, and believe me, we need each other’s support. Please do email me. Sending lots of happy thoughts and waggy tails your way, wishing Tilly a speedy recovery! We are hoping that she does well with this last chemo! More info on her progress in the next few days, starting with tonight. We hope and pray that Tillie has a lot more time to be with you and your family! Thank you so much! She is getting her last chemo treatment today. More info later! Thank you so much. I love your Matilda as well. What a sweet face. Hope Tillie is doing o.k. Yes. Adriamycin is the most powerful. Angel had that on Monday (the 24th). Now we don’t go back for 2 weeks. Had hoped to hear from you. Please reply to radapaul@gmail.com. Thanks. Hi Rada. I e-mailed you . Hope you got it!! Hope Angel is tolerating the adriamycin. Yes, That is what it was with Matilda. She is now 5 weeks post chemo. Today it was cooler here, so she did better on her walk. I’m glad Angel is holding her own!! Adopt Adorable Brandy Alexander, A Cairn Who Never Had Anyone to Love Him! Geography is always on the move, so let's catch up with it! Your go to guide for the world of Dances with Dogs, dog training, responsible pet ownership and animal welfare.